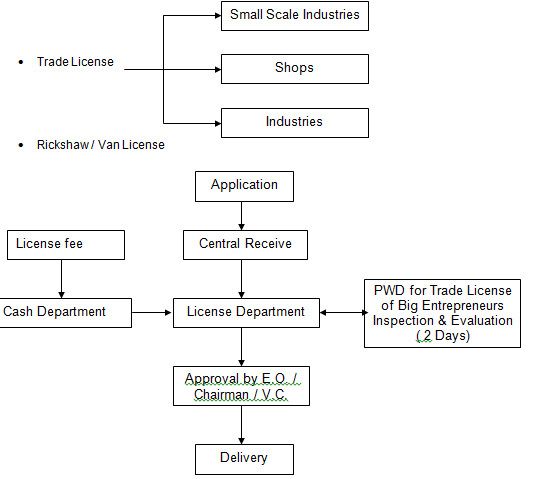 Mainly 3 departments are involved in the license delivery powers. unlicensed rickshaw / van flying within ULB. A regular staff required for vigilance of the above issues. 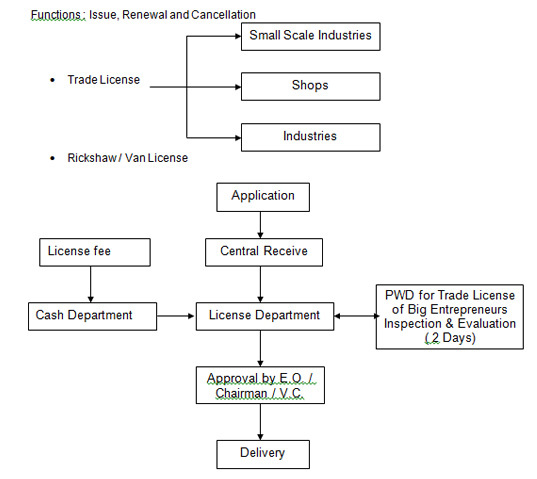 Ideal Stage : Calculation of Commercial charges to be done in the same Dept. 2. Engineering Department :- Functions are distributed in 3 groups. Submission and delivery should be done by the said Department. days maximum to get a connection. Board and municipal apex body. Issue of certified copy of assessment. Building plan assessment and record maintain. 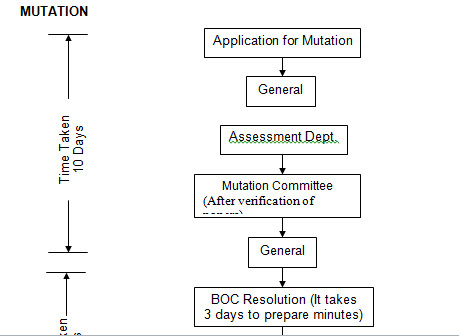 10 days are required to complete a mutation process. It takes 3 days to prepare minutes of BOC resolution. time for completion of mutation. Excess time required for completion of mutation. Mutation cases to be dealt in BOC meeting held once in a month. Solid waste collection from house. Transportation of collected waste to dumping ground. Solid waste collection in market place are done daily. there are one driver and 2 nos. of collies per tractor. Qualified Engineers to be posted at the top. Night sweeping of road and afternoon cleaning of roadside. Sweeping and collection of door to door to be outsourced. Cleaning of roads twice a day. 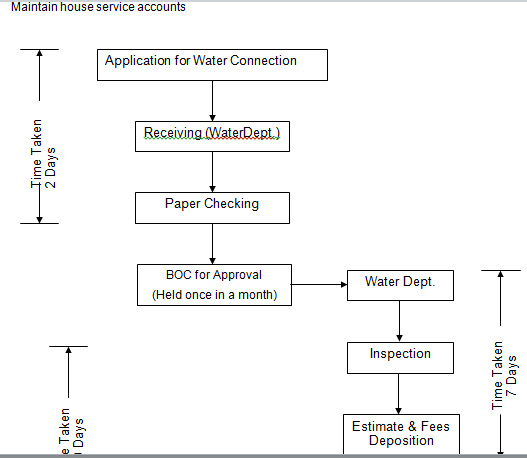 For normal issue of certificates are done in 2 days at a charge of Rs. 30. 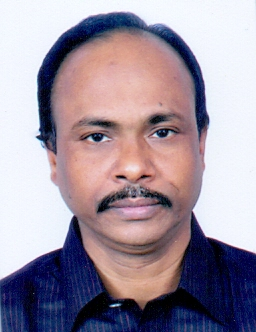 Required one clerical staff for smooth functioning. Computer record to be kept. i) No. of departments involved = 4 Nos. ii) It appears that total process taken 35 – 40 days. Order issued by EO involves a week time. Cash section takes a longer time to disbursed pension. Proposal : Requirement of a food inspector . 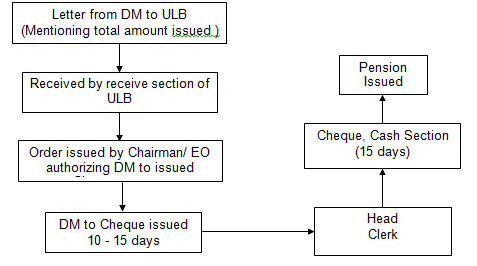 Control service provided by the ULB is irregular causing least effect on control. To be done in a regular process by employing at least 2 staffs. Ideal Stage : Fortnightly vector control. No. of people involved are 2. One dept. is involved in the payment process. In step 1 dept. clerk requires more time due to lack of supporting documents for processing the bill. generally takes 1 month depending on the date of BOC meeting. All supporting documents and MB should be produced with the bills for payment. Payment to be released as soon as possible. Departments / Accounts clerks are required. 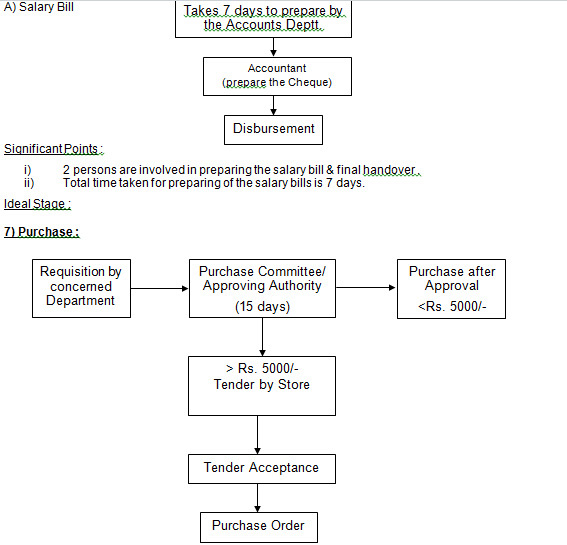 Reasons : Specific Purchase Bill are not found and order are not given in time. Cashier is involved in the process. Total time taken to disburse payment is 2 days. Serving to household & demand notice remain pending for long due to shortage of staff. Reason : Regular increase of no. of houses. Ideal Stage : Total Computerisation.